ExtractNow is a small utility that works with different types of archive files. 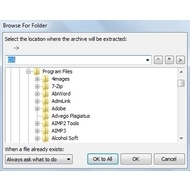 It allows users to extract multiple archives. You don’t need to waste your time until all files will be extracted. All these operations can be done at once. The interface is very simple. It’s easy in use and hasn’t unnecessary elements. There are only 3 buttons (Settings, Clear, Extract), 3 columns (File, Status, Progress) and status bar. 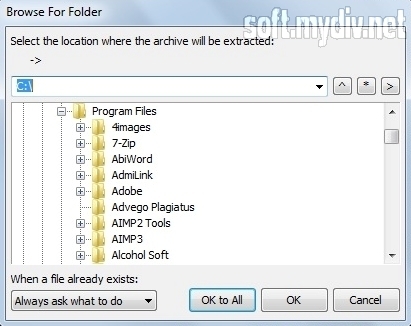 To start extracting you need to drag-and-drop any file on the main screen. You can also use right button of your mouse to add an archive. Then you should click on Extract button and select the location where the archive will be extracted. After that push on OK or OK to All button. The last one means that extracting option will be applied for all files in your list. All extracted files will be marked by green color. If you want to remove any archive from the list, then just choose it and push on Clear button. This utility is very useful, especially when you need to extract a lot of files. The settings menu has 10 tabs. There are a lot of additional options here. You can even extract files using a text list of passwords. There are also customization tools. If you want to use this utility in Linux or Mac OS, you should install Wine. There are no alternative ways to run it on these platforms. There is support for ZIP, RAR, BZ2, TAR, GZ, ISO, GZIP, DMG, IMA, IMZ and other archive extensions. Directory dates now displays correctly. Fixed hang when encountering missing rar archive.